Virtual card was launched by GTBank Nigeria recently, as an added comfort for security conscious online shoppers who prefer not to use their regular debit/credit cards when making local and international payments on the internet. GTBank Virtual MasterCard serves as a fall back option for customers who have forgotten or lost their card, but need to perform urgent online purchases. If you've been profiled for GTBank internet banking, you can easily generate your GTB virtual MasterCard from the online banking portal. After creating it, you will be able to see all the details of the card (number, cvv, expiry date, account number) and you will be able to transfer money to the card from other accounts listed on your internet banking dashboard. ==> Click on "New Request" and follow through the steps. See Photo for clear direction. Once it's successfully created, the details will be listed on the same page. You will be required to enter your token code to view the full details of the card. Note: You must fund your GTB Virtual Master Card before you can use it to make online payments. You can easily do this by making use of the "Own Account Transfer" module via "Account Transfer" but before you can do this, ensure that the virtual card's account number has been listed on your Internet banking dashboard, else you won't be able to fund it. So, if the GTB virtual debit card's account number is not showing immediately you create it, just chill till it appears. You might have to wait till the next working day though. NB : Creating the GTBank virtual debit card is not free. Certain amount will be deducted from one of your GTB bank accounts. More so, you can convert the virtual card to a physical card. This is a post from Ogbongeblog. 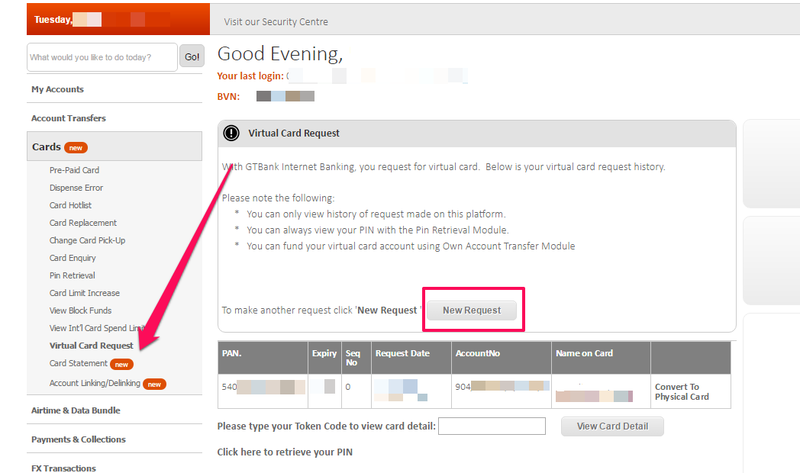 Are you using the GTB Virtual card? Feel free to share your experience.